Today's brides and grooms are looking for ways to make their wedding ceremony unique and different from all the rest. 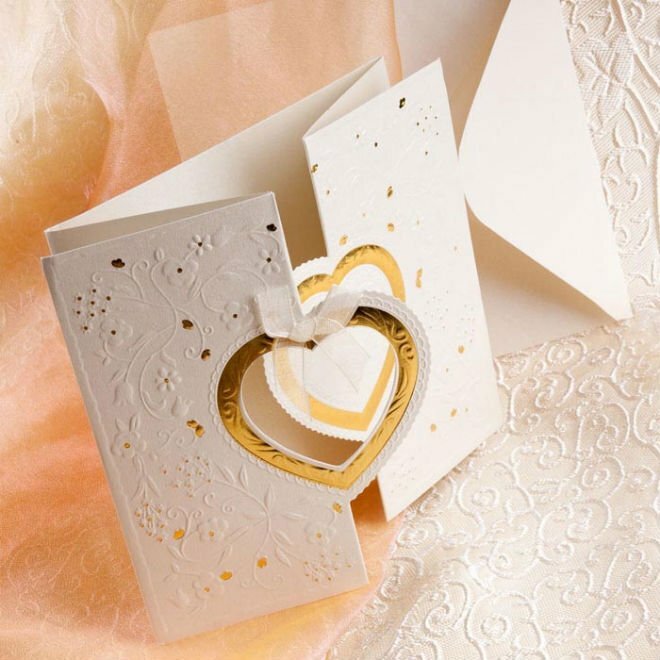 The wedding invitation sets the tone for the wedding itself so it is important to select a unique wedding invitation to announce that special event in distinctive fashion. Here are 5 suggestions for unique wedding invitations that are sure to stir interest and get noticed. In a variety of sizes and shapes, a pocket style wedding invitation holds the invitation in a pocket that is open on one side. The pocket can be a translucent paper printed in a soft floral design or can be a striking solid color that complements the invitation itself. Additional components such as the reception card, response card or even maps to the ceremony and reception are placed in the pocket as well. Then, the pocket is enclosed in the inside and outside envelopes for a very special invitation that is fun to open. Present an invitation that looks more like a gift than a card. Select an invitation that comes complete with a bow in a complementary color. Bows can be tied completely around the invitation or it can be threaded through die cut areas on the invitation and then tied. Invitations tied with a bow are especially pretty and add a unique feel to a regularly printed card. The cost of the bow is normally included in the price of the invitation but does come separately so some assembly may be required. Send an invitation that is more than a simple card printed on one side. Distinctive invitations now come in creative formats that include die cuts and multiple folds. Three panel, accordion folded invitations are popular and attractive, with embossed designs that flow across all three panels. Truly elegant wedding invitations include origami like folds that fold one direction, then another, and are tied with a bow closure. Still others fold and lock with unique die cut designs. Contemporary invitations are gaining in popularity. Some are tall and skinny designs with an envelope that opens on the short end for a unique look that will stand out from normal size wedding invitations. Or, the invitation can be horizontal with the envelope opening on the long side. Either way, these invitations come in a variety of colors, including some with bows as well to accessorize this uniquely sized invitation. hese unique wedding invitations feature a folded jacket that holds the invitation and other components within. Usually open on the top and bottom, the jacket folds on both the left and right sides to meet in the middle like a gate. Often a ribbon is included to tie around the jacket. Or, a jacket can be die cut so that one side overlaps the other or includes a tab that is inserted in a slit to hold it closed. Regardless of what style andyinvitation you choose, make sure the paper and print quality are of the highest standards as your wedding invitation not only communicates the specifics of your big day, it also is a reflection of your taste and style. Unique wedding invitations are as much fun to choose as they are to receive. Once you have selected yours, you may want to take it one step further by having someone dressed in a tux hand deliver them.